The University HealthSystem Consortium (UHC), the member organization of 120 non-profit Academic Medical Centers and their affiliates, encourages hospitals to integrate data into their business plans, in part by demonstrating how data can be used to save lives and improve quality scores. With transparent access to data from more than 400 hospitals (which includes more than 5 million inpatient discharges annually and 25 million outpatient encounters), learn how they make the case for member hospitals to “move and improve” with innovative programming based on data. In this seminar, David will show how members maximize hospital and physician data to measure efficiency and effectiveness. Work in both the inpatient and outpatient settings to capture performance over the continuum of care will be emphasized. The data challenges will be highlighted especially with cost and capturing all inputs to care. Each year the MDRP audience selects who should receive the “Lifetime Achievement Award.” Nominations are now open. Make sure to get your choice in for consideration now. As the longest running MDRP conference, we are honoring the best and recognizing the dedication of those who have propelled this industry forward. Please submit your award nomination(s) here. We have divided the nominations by role in the industry, as so many have worked together to make the Medicaid Drug Rebate Program what it is today. The deadline for nominations is Monday, August 11, 2014 and the winners will be announced at the event during the networking reception on Tuesday, September 16th - So make sure you register to attend the event now. Save $300 when you register by 8/8 with the code XP1958BLOG. To learn more about the program, download the brochure now. Welcome to the MDRP Podcast Series. Joining us today is Grace-Marie Turner, President, Galen Institute. Grace-Marie: I just think that it’s going to be very difficult to convince those other states that have resisted so far because more and more evidence is coming down to show that expanding Medicaid as a traditional program as it is currently structured is real harmful to people. And it’s really harmful to the most vulnerable citizens who are on Medicaid today. If people have many chronic conditions, many of them have no place else to go. They are basically not insurable in the private marketplace. If they are under 100 or 138% of poverty, Medicaid really is their only option. As a result, you wind up with more people competing for the same limited number of doctors who will see Medicaid patients and making it even more difficult for people on Medicaid today to find a doctor to see them. I had a father write to me recently who has a daughter who is on Medicaid – many chronic conditions and in a wheelchair. He said: “It takes me sometimes six weeks to get an appointment with her urologist”. He said: “Do they even think about how much more difficult it’s going to be to get an appointment with the urologist if there are a million more people competing for those same appointments?” So, we must fix it so that it allows the safety net to be intact for the most vulnerable people and give those who have the option to get private coverage to do so, so that they are not competing. And then finally, I think that the states who want to expand the program need to guarantee that providers will be paid enough that they will be able to see a Medicaid patient. In some states like New Mexico that have a very high match rate, Medicaid pays at very close to Medicare rates. In other states, a doctor may be paid $5 or $7 for an office visit – not even enough to begin to cover expenses. Doctors want to take care of these patients, but they can only keep so many and keep the lights on and pay their own bills. So, we’ve got to be able to pay providers more and that’s the kind of leverage that I think that the states would be able to have if they were not so constrained by an avalanche of federal rules and all the “Mother May I?” waiver requests that they have to get to make any changes to their plan. If they had more flexibility, then they could make sure that patients on the program today could actually find a doctor to see them and also make sure that those who may be in an expansion population have the option of coverage that looks more like the private insurance and the private marketplace so that it’s a track and a platform to private coverage rather than the cliff that Medicaid is today – either in or out. If you make $1 too much money then you’re out of Medicaid or $1 less and you’re in. It needs to be a smoother ramp to private coverage and there are a lot of ideas to do that, including giving people the option of basically taking their Medicaid allotment as a voucher to buy into private coverage. There are a lot of ideas out there to improve this program, but we need to remember that we’re doing it for the most vulnerable citizens who are on the program today, who have no place else to go, competing for a limited number of appointments with a shrinking number of doctors to actually get appointments. We can do so much better and I think you’re going to see many more governors actually demanding those kinds of changes and that kind of flexibility in exchange for any expansion. To hear more from Grace-Marie, make sure you join her at MDRP 2014 this September 15-17 in Chicago. As a reader you can save an extra $100 off the current rate when using the code XP1958BLOG. Register now to save! Attention Health Plans! 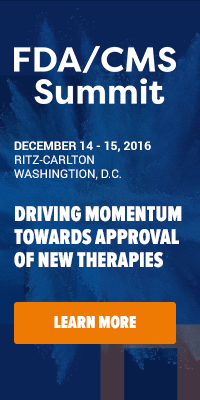 Join us at the Specialty Pharmacy Collaboration Summit and for a limited-time only, we're offering a Buy One, Get One offer*! Expiring this Friday, July 25th, purchase one pass and have a colleague attend for free! Be sure to use code: XP1968BOGO. To register, call Roxana Siu at 646-895-7452 or email rsiu@iirusa.com. 2. If the paying delegate cancels, the free delegate will receive an invoice for the amount of the paying delegate. 3. Tiered pricing is valid through expiration date. New pricing takes effect at specific dates indicated. All fees must be paid in full by expiration date or your price will increase to the next level tier. 4. Offer cannot be applied retroactively to confirmed paying registrants. 5. Offer cannot be combined with any other discounts or promotions. 6. All BOGO registrants and guests are subject to IIR approval. The complexities involved in identifying and resolving Medicaid disputes have only grown since the ACA with the additional claims from Managed Medicaid Organizations. In this session we will discuss some common best practices related to working collaboratively with your state contacts to either avoid disputes or resolve them quickly. Kelly Geissler, Sr. Analyst, Government Rebate Operations, Johnson & Johnson Health Care Systems Inc.
For more session information, download the brochure now. Blog readers receive an extra $100 off the current rate when you use the code XP1958BLOG. Register by 8/8 to save $300! What is the future of specialty pharmacy and the impact on the key stakeholders? Nick: When you look at specialty pharmacy, in my mind it is still an evolving area of pharmacy. Specialty pharmacy really came into being, I would say, at least 20 years ago where it was the very beginning of specialty pharmacy with products like betaseron in the Multiple Sclerosis space, as well as products like Crixivan in the HIV space back in the mid-80s. The model has evolved and has evolved dramatically over the last 10 years or so. At this point in time, it is really quite dominated by the Big 4, Big 5 large PBMO and health plan owned specialty pharmacies. Therefore, when you look at a model like the one that I represent or CSPN – quite honestly the smaller pharmacies are being shut out of a number of opportunities. Now, there are a number of good reasons for that. Many retail-based or community-based pharmacies simply have not developed the infrastructure to support a specialty product which, as I mentioned earlier, is a high-touch model. Many of these pharmacies have not developed the benefit investigation needed, the reimbursement support infrastructure needed and really the clinical support needed to truly manage dictation. However in our model, for example, there are a number of community players – smaller, independent pharmacies – that have developed all of these resources. They have also developed accreditation through some of the accrediting groups like URAC and ACHC. As well, they’ve become members of organizations like NASP – National Association of Specialty Pharmacies. So, they have truly developed the model over time. As I said, the industry is still dominated by the Big 5 and Big 6 and again, I think what’s going to happen over time as this model starts to develop is that you are going to need more pharmacies with the capabilities to handle the special dictation. There are many, many products. Development on the oncology side, for example, on the Multiple Sclerosis side and the Rheumatoid Arthritis side that I think will require a larger group of pharmacies that truly have the capability to manage that patient. So, that’s where I see it. I see the future of specialty pharmacy really expanding and creating opportunities for stakeholders beyond the few that have truly taken advantage of this space up to this point. Click here to download the rest of the transcript and podcast. To hear more from Nick, please join him at IIR's Specialty Pharmacy Collaboration Summit, September 15-17 in Boston. Also, you can save an EXTRA $100 off the current rate, $500 in total savings when registering by 7/25 with the code: XP1968BLOG - Register now. According to specialty pharmacy experts, patients who rely on specialty drugs to treat their rare and complex conditions may be forced to pay a large percentage of the drug’s cost instead of a traditional fixed copay, if they are in an Affordable Care Act (ACA) exchange health plan. Despite some of the exchange plans having the draw of lower monthly premiums, people should prepare themselves for higher deductibles and unpredictable out of pocket costs. Even though the cost structures do vary between the exchange plans, patients may face this issue no matter what exchange plan they are enrolled in. Avalere examined 603 unique plan designs offered by 60 different carriers in 19 states to assess whether specialty medications are being put in a higher tier with a larger percentage of coinsurance, said Jenna Stento, a senior manager at Avalere. The analysis found that 59% of silver plans on exchanges across the country use coinsurance on the specialty tier instead of a fixed copay. 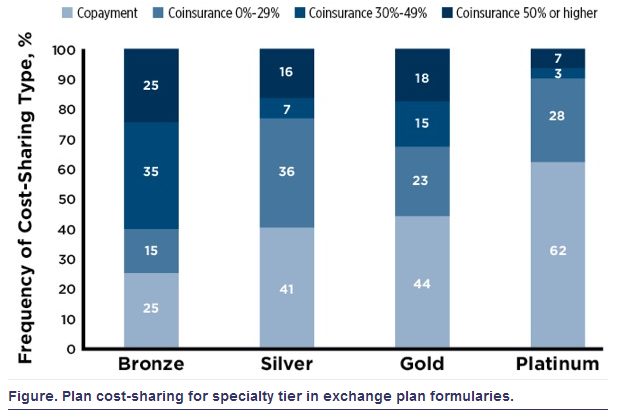 It also found that 23% of silver plans charged coinsurance rates of at least 30% more than the cost of the drugs on the highest formulary tier, and 60% of lower-premium bronze plans apply specialty tier coinsurance greater than 30% of the drug price. With the number of underinsured and strained patients continuously growing, how can these concerns be corrected? To learn more about Specialty Pharmacies, Specialty Drugs, the Affordable Care Act, and much more, join us in Boston this September for the Specialty Pharmacy Collaboration Summit. Register by 7/25 with the code XP1968BLOG and take an extra $100 off the current rate - that is $500 in total savings! Register here. As electronic health record use becomes widespread across the United States, largely due to the implementation of the Affordable Care Act, the quantity of clinical data that will become available for research and analytic purposes will also dramatically increase. 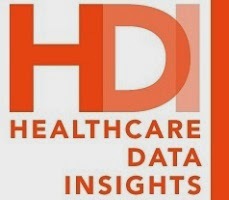 Experts in healthcare have become increasingly focused on clinical analytics that analyze large quantities of data for the purpose of gathering insights that have the potential to improve the value of patient care – a process that is known as big data. In a new research study published in Health Affairs on July 8, 2014, researchers highlight some of the clearest opportunities to reduce costs through the use of big data. Specifically, they discuss the role of algorithms in reducing cost in the following categories: high-cost patients, readmissions, triage, decompensation (when a patient's condition worsens), adverse events, and treatment optimization for diseases affecting multiple organ systems. "The examples we present in this study provide key insights to the 'low hanging fruit' in healthcare big data and have implications for regulatory oversight, offer suggestions for addressing privacy concerns and underscore the need for support of research on analytics," said David Bates, MD, MSc, chief quality officer at Brigham and Women's Hospital and lead author on the study. Only 5% of patients account for about half of all U.S. health care spending. Bates and his co-authors articulate the issues that need to be addressed to identify and then manage these high cost patients. They include formalizing an approach to predict which patients are likely to be high cost, what measurements can be incorporated to improve this prediction, particularly those focused on mental health, and how to make these predictions actionable. Researchers emphasize that making new analytic systems effective will rest on the ability to make these predictions easily available to clinicians in a way that does not disrupt current workflow. Researchers write that as many as one-third of readmissions may be preventable, which provides a significant opportunity for improvement in care and reduction in cost. Bates and his coauthors suggest that all health care organizations should use algorithms to predict who is likely to be readmitted, but highlight the challenges of implementing such algorithms. They include: tailoring the intervention to the individual patient, ensuring that patients receive the interventions intended for them, monitoring specific patients after discharge to ensure they do not develop issues that would cause their condition to deteriorate, and ensuring a low ratio false positive rate of patients flagged for an intervention to patients who experience a readmission. Effective triage is essential to estimating the risk of complications when a patient first receives care in the hospital setting. This is important in order to manage staff and bed resources, ensuring the patient is sent to the correct unit for care and overall it informs the management of the patient's care. Researchers suggest integrating a triage algorithm into clinical work flow, and underscore the importance of having a detailed guideline to clarify how specifically the algorithm will inform care. Researchers examine two pilot studies which provide lessons learned in establishing effective triage algorithms. When a patient's condition worsens, there is often a period in which physiological data can be used to determine whether the patient is at risk for decompensating. Researchers explain that the initial rationale for intensive care units (ICUs) was to allow patients who were critically ill to be closely monitored for this purpose. Researchers emphasize such systems can now be used throughout the hospital, and that effective analytic systems in this area must use multiple data streams to detect decompensation, as many new technologies are becoming available that can be used to better monitor patients. Adverse events, while expensive and can result in high rates of morbidity and mortality, are preventable at high rates. Researchers call out three areas, renal failure, infection and adverse drug events, as specific opportunities to utilize big data to reduce costs. Chronic conditions that span more than one organ system or are systemic in nature are some of the costliest conditions to manage. Autoimmune disorders such as rheumatoid arthritis and lupus frequently fall into this category and the ability to predict the trajectory of these diseases would immensely assist the caregivers deliver expensive therapies in a more targeted way. Focusing on the usefulness of big data in this area could result in effective approaches that can combine the many measurements taken as part of routine care to predict the progression of a patient's disease and personalize treatments and therapies appropriately. Access to health records with pertinent data has been the biggest limitation in adopting the use of big data in treating chronic diseases, but as the use of electronic health records becomes widespread, advances in this area are ripe for both improving patient care and reducing costs. Researchers emphasize that these six cases are not an exhaustive list of the ways in which big data can be useful in improving value in healthcare. Specifically, they note that these examples, which focus on inpatient settings, will likely be transferrable to the outpatient setting as well. "Support for research that evaluates the use of analytics and big data to address these six use cases, as well as thoughtful consideration of regulation and payment is warranted," says Bates. "Additionally, as multiple streams of data become available for analytic purposes, consideration of patients' privacy and their desire to link disparate sources of data will be of the utmost importance." Source: This story is based on materials provided by Brigham and Women's Hospital. Rising Healthcare Costs | What are the Biggest Challenges? Welcome to the Specialty Pharmacy Collaboration Summit podcast series. Joining us today is Robert Popovian, Senior Director, US Government Relations, Pfizer Pharmaceuticals. What are the biggest challenges that you face presently with rising healthcare costs? Robert: Well, healthcare costs are increasing. We are close to about 20% of our GDP is spent on healthcare expenditures and that number is going to continuously go up, just because of the demographics in the United States. If you look at spending and healthcare in general with regards to pharmaceuticals, pharmaceutical spending has risen slowly and overall healthcare spending – as well as other healthcare segments in the last few years – and the price increases have been pretty much in line with the other segments of healthcare. The challenge that we have with healthcare expenditures in the United States is that we have a very dysfunctional payment mechanism in the US where we are challenged with an outdated insurance policy model where we don’t necessarily pay for the best interventions in healthcare because of the mechanisms of reimbursement where we have pharmaceuticals vs. hospital payments vs. outpatient payments vs. other services being paid separately. Because of that, no one cost beneficial intervention is the one that is put in the front of the others. To hear more from Robert, please join him at IIR's Specialty Pharmacy Collaboration Summit, September 15-17 in Boston. Also, you can save an EXTRA $100 off the current rate when registering with the code: XP1968BLOG - Register now.